A photograph of a sign attached to a chair at the Canterbury Cultural Recovery Centre. The sign reads, "Look at me... But please don't walk on me!" 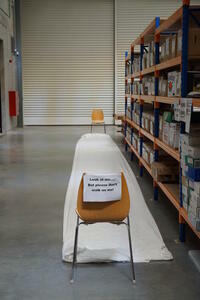 A object from one of the collections has been laid flat on the floor and wrapped in white linen for protection. A photograph of the Canterbury Cultural Recovery Centre's main floor. Signs indicate shelves containing collections from the Lyttelton Museum, Order of St John and the Canterbury Rugby Football Union. 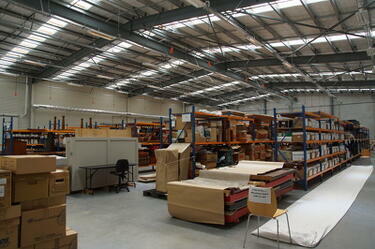 A panoramic photograph of the Canterbury Cultural Recovery Centre's main floor. 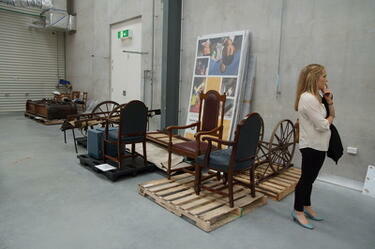 A photograph of CEISMIC Digital Content Analyst Alexandra King standing next a collection of furniture being stored in the Canterbury Cultural Recovery Centre. 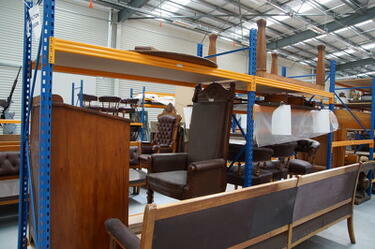 A photograph of furniture being stored on top of a pallet at the at the Canterbury Cultural Recovery Centre. 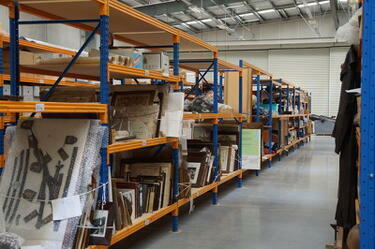 A photograph of material from the Lyttelton Museum's collection being stored on the Canterbury Cultural Recovery Centre's main floor. The collection includes framed pictures and maps, and Navy memorabilia. 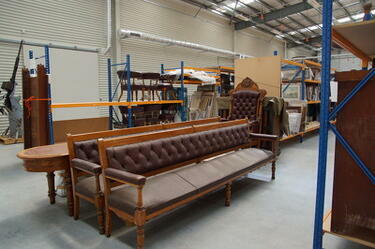 A photograph of furniture stored at the Canterbury Cultural Recovery Centre. 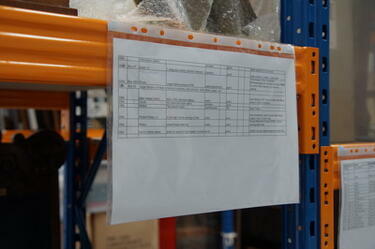 A photograph of an inventory list of some of the items stored at the Canterbury Cultural Recovery Centre. 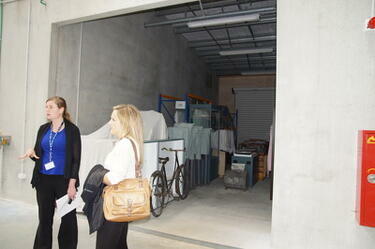 A photograph of CEISMIC Digital Content Analyst Alexandra King and the Canterbury Cultural Recovery Centre intern, Moya Sherriff, discussing the collections. 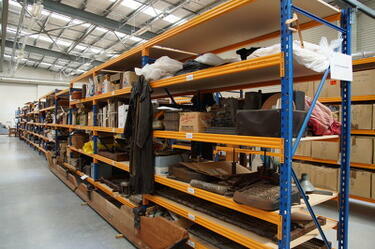 In the background is material from the Kaiapoi Museum's collection. 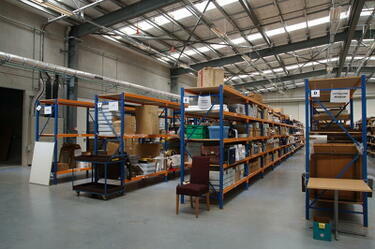 A photograph of the Canterbury Cultural Recovery Centre's main floor. 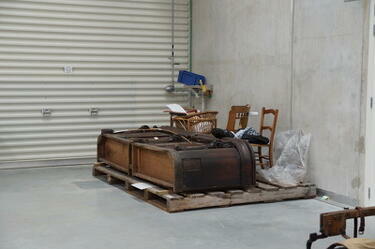 A photograph of material from the Lyttelton Museum being stored at the Canterbury Cultural Recovery Centre. A close-up photograph of mannequins stacked in the storage shelves at the Canterbury Cultural Recovery Centre. A photograph of mannequins stacked in the storage shelves at the Canterbury Cultural Recovery Centre. 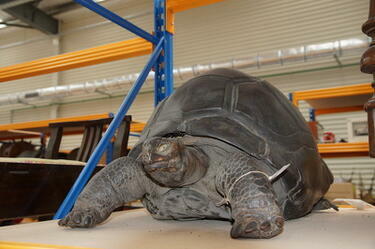 A photograph of a stuffed tortoise that is being stored at the Canterbury Cultural Recovery Centre. 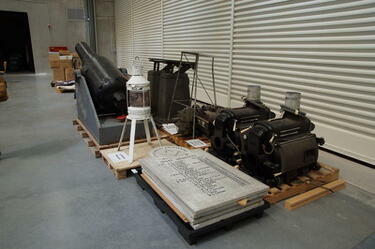 A photograph of a cannon, a lantern, a marble honours board and other large objects from museum collections which are being stored at the Canterbury Cultural Recovery Centre. 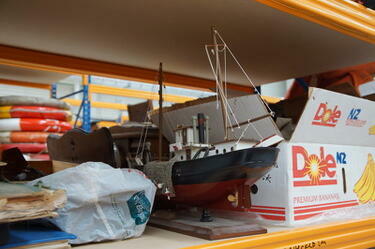 A photograph of a model ship that is being stored in one of the stacks at the Canterbury Cultural Recovery Centre. 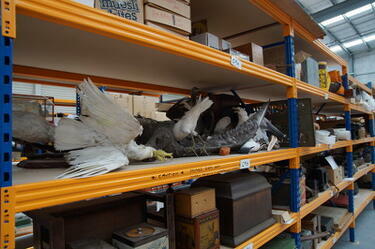 A photograph of stuffed birds in the stacks of the Canterbury Cultural Recovery Centre. 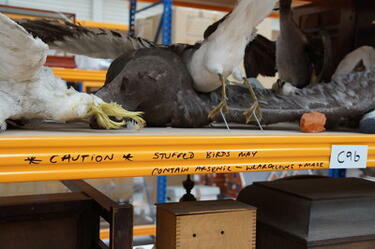 Writing on the shelf reads "Caution, stuffed birds may contain arsenic - wear gloves and mask". 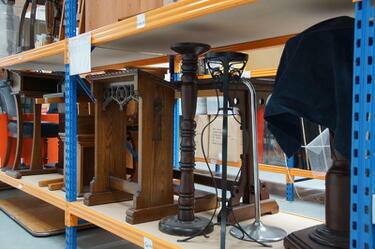 A photograph of two lecterns and other furniture being stored at the Canterbury Cultural Recovery Centre.